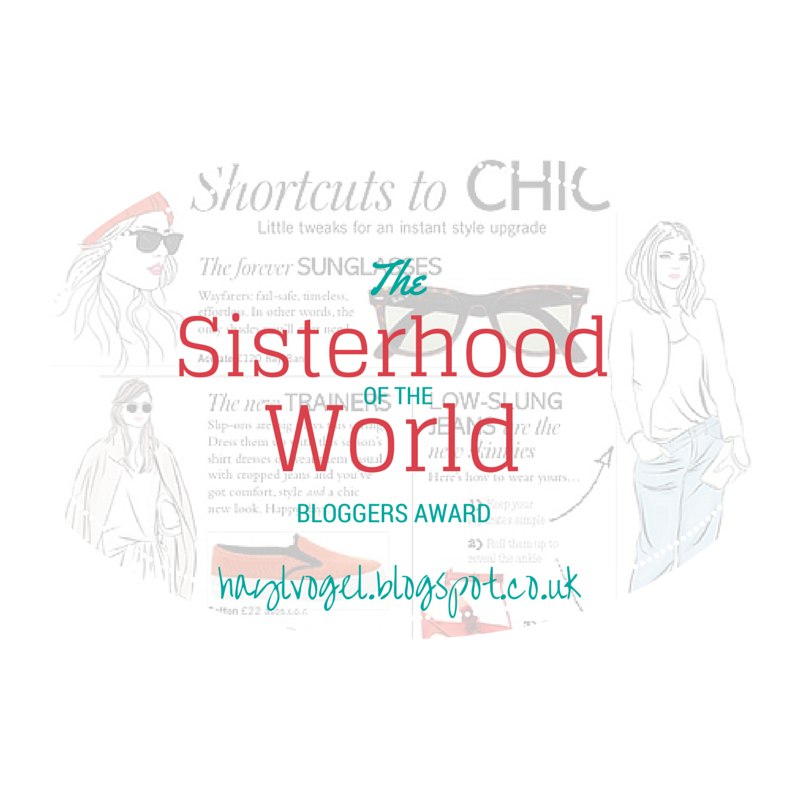 The Sisterhood Of The World Bloggers Award. | H A Y L V O G E L.
The Sisterhood Of The World Bloggers Award. Hello and welcome to another blog award post!? I can't believe I've been nominated for another one so soon - a huge thank you to the lovely Sophie from http://petalsofperfection.blogspot.co.uk/ for nominating me. 1. You thank the blogger who nominated you and link their blog. 2. You answer the list of questions they've given you, and create a list of your own 10 questions for your nominees. 3. Nominate 10 Bloggers to receive the award. - Uuuum, I would probably say my eyes? - I have no idea.. haha! 3. What's the best thing that someone has said to you? - Probably that they love me? That's always good to know..
4. If you could make up a word what would it be and what's the definition? - I have loooooads of quotes from films that I say aaallll the time so I can't really answer just one.. but for the sake of this, "do you wanna build a snowmannnn?" 6. What would you do if you got told that your life was all a dream? 7. Would you want to know what happens to you in 2015, like your own 2015 trailer? - Um, probably not. But I like to have everything planned out so it would be very tempting! 8. Favourite place to go on holiday and why? - I haven't been for a while, but my favourite place was Portugal. I just thought it was so pretty and such a lovely atmosphere. 9. What is your best characteristic (i.e. kind, funny)? 10. If you could have one celebrity friend, who would that be and why? - Okay, this is the easiest question in the world. Zac Efron. Because he's the love of my life. 1. Who inspires you the most in your everyday life? 2. How often do you blog? 3. Whats your favourite film? 4. What camera do you use for your blog photo's? 5. What's your favourite colour? 7. If you could be anyone for a day who would it be? 8. What are your new years resolutions? 9. Do you have any fitness tips/routines? 10. Do you have any hobbys? My gorgeous mummy, she always always knows what to do. This is a tough one, I think Love Actually, classic rom com. Actually at the moment (the professional I am) I'm using my iPhone camera as my old camera broke! However I'm hoping to get one for my birthday in March. I don't actually think I have one, if I had to pick it would probably be a pastel green. Obviously I love MAC, but being a student I can't really afford it everyday. I have such a mix of make up products but Rimmell is a pretty trustworthy brand for a lot of my day to day make up. Hmm I think I'd probably just like to be a random guy, I'd like to see how their brains work. I only like to do new years resolutions I can actually keep, so I only did one. I drink three bottles of water per day, it's going well so far! I go to the gym a lot andI'd say blogging was as hobby, I love it!